Similar to the 'Attempted vs. Achieved change in Spherical Equivalent' graph, this scatter plot shows the attempted change in cylinder magnitude vs. the achieved change in magnitude (based on vector calculations). Any data point blow the diagonal 45° line reflects an eye with cylinder undercorrection and all dots above represent an cylinder overcorrection. Data points below the horizontal axis line represent eyes with induced astigmatism. Important: This graph does not show cylinder axis changes by definition. 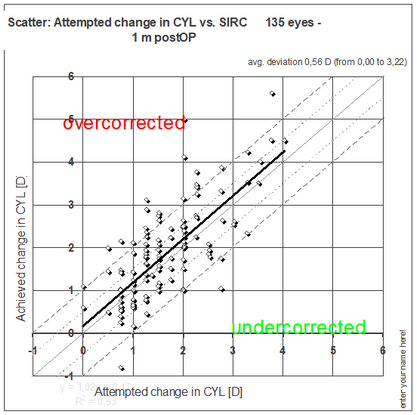 If the postOP cyl magnitude is higher than pre OP ('induced astigmatism) and the axis change is within +- 45! ('same axis') dots will appear below the horizontal axis and considered as undercorrection. If the postOP magnitude is higher than preOP and the axis changed by more than +- 45° the eye will be considered overcorrected and appear above the diagonal 45° line. Note: In highly scattered data sets, more data points may exist outside the visible range and can be seen only in the edit mode of MS Graph.